AirFish-8 combines aviation and marine craft technology to create a machine capable of travelling across the waves. It has a 500HP engine that can make the craft travel up to 121mph. AirFish-8 can carry 8-10 passengers. It is currently in a trial phase but company Wigetworks hope to have it fully operational by mid-2018. 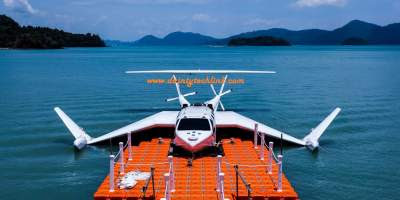 The AirFish-8 is an alternative method of sea transportation, combining the technologies of aviation and marine craft. Company Wigetworks have created AirFish-8, a boat/plane hybrid that glides on water. Due to the machines unique structure, it is able to utilise what is known as the "Wing in Ground Effect." This is when an aircraft is able to produce additional lift when flying near the ground. AirFish-8 has a V8 car engine, which runs on unleaded petrol and can travel up to 121 mph; that's three times faster than typical marine craft. The sea-craft is currently still in a trial phase but the company hope to have it fully operational by mid-2018.